Webster’s dictionary defines virulent as meaning “extremely poi-sonous or venomous, noxious, deadly”. I’ll gladly plead guilty to a tendency towards pointing out that the emperor has no clothes, but “extremely poisonous”, “venomous”, no. Dr Mansergh is incau-tious and inaccurate in his choice of grounds for choosing only now to question a number of matters referred to in my biographies of de Valera, and Michael Collins, cur-rently in their 12th and 15th years of publication. But because Dr Mansergh’s deservedly high-reputation might of itself give credence to his misstatements, for the record I intend to deal here with a sample few of these. In one case, that of Joe McGrath’s account of what de Valera said about Collins’s reputation growing at his expense, I will give a hitherto unpublished, and damningly significant, illustration of what de Valera’s attitude towards “The Big Fellow” really was. The other matters concern the authenticity of de Valera’s parents’ marriage and Dr Mansergh’s ill-advised comment that de Valera did not intend the Irish Press to be “an instrument of enrichment”. On the marriage Dr Mansergh wrote: “Opponents have long insinuated doubts about the legitimacy of deValera’s birth and the authenticity of his parents’ marriage, though few children born out of wedlock were registered in their father’s name.” Taking the registration issue first: Initially de Valera was not registered in his father’s name. The state of New York records contain two de Valera birth certificates. The first, registered on November 10th, 1882, gives his name as George de Valero.The second was marked “corrected” on June 30th, 1916, by de Valera’s mother, the former Catherine Coll, who by then had married a Charles Wheelwright and was attempting to prove de Valera’s American citizenship to save him from a firing squad. It is in this certificate that the first name is given as Edward and the surname as de Valera, and by then, of course, the man claimed to be his father, one Vivion de Valera, was long dead. De Valera was born at the Nursery and Child’s Hospital, Lex-ington Avenue, New York, a home for destitute orphans and aban-doned children on October 14th, 1882. He was baptised on December 3rd, in nearby St Agnes’s Church, his father’s first name being given as Vivian, his surname as De Valeros, his own first name as Edward. Almost 50 years later Vivion de Valera, de Valera’s eldest son, vis-ited St Agnes’s and, in an unusual courtesy, was given permission to alter the certificate in his own hand writing so that it now reads Vivion, de Valera and Eamon. De Valera’s official biography (Longford/O’Neill, Hutchinson, London, 1970) states that his parents were married at St Patrick’s in Greenville, New Jersey, on September 19th, 1881. I went to Greenville and on checking the parish records, discovered there was no record of any Coll – deValera wedding either at this church or any church in the vicinity in a period of 12 years from 1875 to 1887. Nor did a check on the record of civil marriages for the period show such a wedding. My investigations had nothing to do with insinuation, but everything to do with exploring the unwarranted, but real, pressures which the stigma of illegitimacy in the Ireland of the day would have had on the psychology of a proud and not insensitive man, whose principal domestic political opponent, Michael Collins, was born of a secure marriage into a large and loving family. The statement involving Joe McGrath that Dr Mansergh challenges was de Valera’s rejection in 1966, of a suggestion by McGrath that he become a patron of a Michael Collins Foundation, which would provide deserving students with an education. 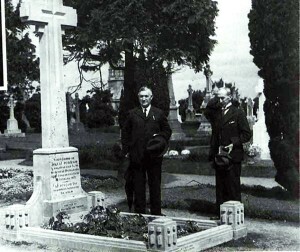 The foundation suggestion originated from Johnny Collins, Michael’s brother, who felt that scholarships would be a more fitting tribute to his brother’s memory than McGrath’s initial proposal, which had been to erect, at his own expense, a memorial to Collins at Sam’s Cross in west Cork. Johnny’s son, the late Michael Collins, a prominent businessman and a chartered accountant, was involve in and supportive of the foundation, as were Michael’s brothers, the late Col Pat Collins and Liam Collins of Clonakilty, one of Cork’s leading solicitors, also deceased. I knew all three, Michael Collins since our days together in Blackrock, and I would rate them as being among the most honourable men I have ever encountered. Michael first, and subsequently the other two, told me that when Joe McGrath, who was dying at the time, put the foundation proposal to de Valera he replied: “I can’t see my way to becoming patron of the Michael Collins Foundation.It’s my considered opinion that in the fullness of tune, history will record the greatness of Collins and it will be recorded at my expense”. McGrath formally conveyed this response to Michael Collins in his capacity as an administrator of the foundation fund. Dr Mansergh now asks how can we be sure that those words are exact? If he had raised that question 15 years ago when my book was first published, I can assure him the Collins brothers would have given him his answer. Dr Mansergh avers that de Valera freely recognised Collins’s qualities. He most emphatically did not. Behind de Valera’s refusal to sup-port the foundation there also lie several other examples of mean-spiritedness, such as the squabbling for years over the attendance of the Army at Bealnablath, or the air-brushing of mention of Collins out of the official Department of foreign Affairs publication. Facts About Ireland. In particular, there is the sorry saga of the Collins memorial in Glasnevin cemetery. It is a matter of record that for years Johnny Collins, a civil servant, and thus very much at de Valera’s mercy, strove unsuccessfully to have a fitting memorial erected over his brother, who, as the first Com-mander-in-Chief of the Irish Army, lay in a military grave. Again McGrath had offered to fund this, but the family insisted on paying for the memorial themselves. Finally, de Valera called Johnny in and stipulated that the cost of the memorial should not exceed £300, and it should be in limestone, not marble. He prescribed a formula of words he wanted used on the cross and ordered that there be no English on the front of it. 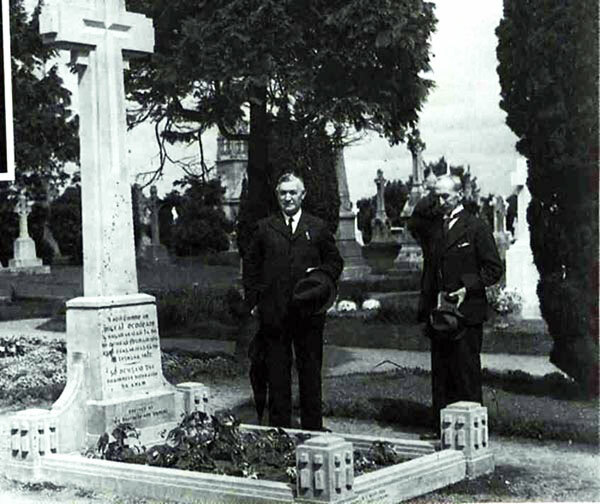 The cemetery records show, that, on July 31st, 1939, a few weeks before the world went to war, Taoiseach de Valera took time out to sign personally the certificate of authorisation for the design and erection of the memorial cross over his old adversary. What the certification does not show is the fact that de Valera forbade Johnny to allow attendance at the dedication ceremony, either by the press, the public, or by any member of the Collins family apart from Johnny himself. Only the officiating priest and an altar boy were permitted to be present. Had an out-raged off-duty gravedigger, who tended Collins’s grave, not accidentally come across the melancholy little ceremony and hailed a passing tourist with a camera, there would have been no pictorial record of Johnny standing alone, apart from the gravedigger, at his famous brother’s graveside. It was published, for the first time, in my biography of Collins. Before leaving the attitudes issue, let me place on public record for the first time another incident from 1966 which indicates that the turning down of McGrath’s foundation approach was not an aberration, but an accurate indication of deValera’s mindset towards Collins. It was described to me by Gene Foley, a member of President Kennedy’s cabinet, whom I interviewed in Washington in March 1997. I still have my reporter’s note-book containing the record of our conversation. The 1916 the 50th anniversary celebrations at the GPO were attended by a distinguished Irish-American delegation, including Congressman John Fogarty of Rhode Island, a particular favourite of de Valera’s because of Fogarty’s record in sponsoring House resolutions advocating Irish unity. Foley was so close to Fogarty and his three brothers, that he said he was described as “the fifth Fogarty”. Foley told me that, at a convivial reception in Aras an Uachtarain after the GPO events, Fogarty took advantage of his standing with de Valera to inquire: “Mr President, what’s the story of your involve-ment in the death of Michael Collins?” De Valera replied: “I can’t say a thing John but – that fellow had it coming to him.” In view of the pain caused over the years to the shareholders and former employees of the Irish Press, particularly in the wake of RTE’s scarifying documentary on, how de Valera established the Irish Press and handed it over to his family, Dr Mansergh’s comment that de Valera did not structure it “as an instrument of enrichment” was singularly thoughtless and ill-advised. As the programme made clear someone who received considerable enrichment for his shares was the author of the book Dr Manseragh purported to be reviewing, Terry de Valera, deValera’s son who ceded control of his voting shares to his nephew Eamon de Valera for £225,000 in the 1980s. Allowing for inflation this would be worth approximately €500,000 today. And, following this transaction, Terry de Valera’s then son-in-law Elio Malocco became a director of the company and was entrusted with the company’s legal business. By a curious coincidence, as word about the programme spread, for the first time since the 1970s, ordinary shareholders received out of the blue, a dividend of 15 per cent (less tax). Shareholders have also received an offer to buy their ordi-nary shares at a price of €7.50 each. Apart from his voting shares, according to the company accounts, the company’s managing director and secretary, Eamon de Valera, now holds 464,803 ordinary shares. In my view the assets of the company should be realised and given to its pensioners. But that is a subject for another day, for the moment I mention the Irish Press only to refute Dr Mansergh’s propagandist assertions.